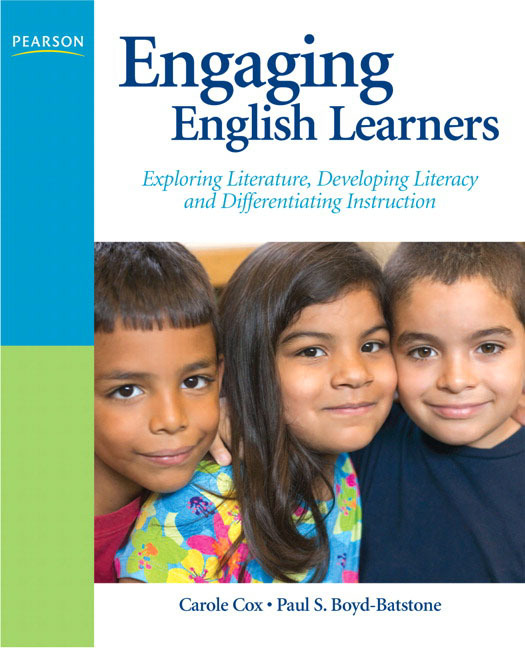 Written with a captivating voice, Engaging English Learners: Exploring Literature, Developing Literacy and Differentiating Instruction, 1/e presents teachers with a charming recital of the conversations and advice that are sure to engage every learner in an active role to glean meaning from text. Together, the authors highlight the use of reader-response theory in classrooms and uncover how it can affect literacy learning and second language acquisition. This book is a testament to their philosophical approach, illustrating how student-centered instruction using literature, can differentiate instruction for English learners, engaging them in purposeful reading and writing. "A Thought from Carole/A Thought from Paul" - throughout the book, the authors provide a commentary on each other's writing, and make connections between practice and theory. Case Study Connections: These appear as boxed inserts throughout the text with questions and prompts related to chapter content and refer the reader to A Case Study of Juan, Anne, or Eduardo to read, reflect, and apply their thinking to practice. Exploring ideas: Each chapter ends with a list of ideas to explore as a way of guiding the reader's reflection on the chapter content, or to use as a discussion prompt, or suggest things to do in classrooms with English learners to put the ideas in the chapter into practice. Children's work: Examples of children's written and art work illustrate the content throughout the book. Paul Boyd-Batstone, Ph.D., is an Associate Professor of Language and Literacy at California State University, Long Beach in the Department of Teacher Education. He taught for over 15 years as a Spanish/English bilingual teacher in elementary settings and initiated one of the first Cambodian, Khmer-speaking bilingual programs in the country. He has published numerous articles and texts, including Engaging English Learners: Exploring Literature, Developing Literacy and Differentiating Instruction with Carole Cox. Carole Cox, Ph.D., teaches at California State University, Long Beach where she was named the Outstanding Professor in 2001. She taught elementary school in Los Angeles and Madison, Wisconsin. Students she taught in 3rd-5th grades in the 1960's and 70's and others who participated in a Shakespeare for Children summer program she created in Madison held a reunion for her in 2005 and the Mayor of Madison declared July 2, 2005 Carole Cox Day. Her publications include a textbook Teaching language arts: A student-centered classroom, 6th ed. (Pearson Teacher Education and Development, 2008), and a new book with co-presenter Paul Boyd-Batstone, Engaging English learners: Exploring literature, developing literacy, and differnetiating instsruction (Pearson Teacher Education and Development , 2009), among others. Her research has focused on children's stance towards literature from a reader-response perspective.